Broadcaster Channel 4 has emerged as one of the winners from the Grand National weekend as figures showed a peak audience of £8.9million tuned in for Saturday's big race at Aintree. That represents a 61% share of the television audience at its peak, with 8.4m watching the 15-minute race itself and an average of 2.9m following the entire afternoon's coverage, which lasted from 1pm to 5.15pm. The news is a boost for Channel 4 Racing, which now has a monopoly on terrestrial coverage of British racing after agreeing a £20million deal last year. Jamie Aitchison, Channel 4's sports editor, said: "We are delighted to be broadcasters of this iconic race. 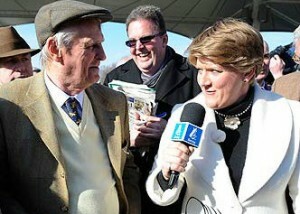 Congratulations to Aintree for putting on such a fabulous spectacle for our viewers. "Channel 4 has shown this week our commitment to this fantastic sport and I would like to congratulate IMG [the production company] for their coverage across the three-day meeting. It's a super start to our four-year deal and we look forward to coming back next year." The audience figures compare very favourably with the final BBC broadcast from Aintree in 2012, which attracted a peak of 10.9m viewers, and actually exceeds the figures for the three preceding years - 8.8m in 2011, 7.6m in 2010 and 8.5m in 2009. "I would like to thank Aintree and the British Horseracing Authority for the handling of the event and the welcome to a new team," added Carl Hick, the executive producer of the Channel 4 broadcast. "They gave us unlimited access to all areas to showcase the greatest horse race in the world. "The greatest result of all, after the fantastic win for Sue and Harvey Smith, Ryan Mania and the owners of Auroras Encore, is that all 40 horses and jockeys came home safe and sound."